Before we begin, a cheater’s guide to Lumbini, compiled from the Internet as well as a handy pamphlet I currently have sitting on my lap. Lumbini is in the southern-most part of Nepal, mere kilometres from the border with India. The village attained its claim to fame millenniums ago, when Prince Siddhartha was born in the shade of a local Bodhi tree. Prince Siddhartha is probably better known by his other name: Lord Buddha, and his eventual enlightenment represented the advent of Buddhism as we know it today. Nowadays, Lumbini is one of the holiest pilgrimage sites for Buddhists world over, and attracts thousands of Buddhists and tourists every year. Cleaning time: The giant Buddha statue at the entrance to the World Heritage Site. For me, Lumbini came in equal parts Buddhism and bicycles. Just in front of the strip of hotels and guest houses near the bus park in Lumbini are a handful of bicycle rental shops. Both Marlon and I had read that the best way to explore the flat grounds of Lumbini were from the saddle of a bike. Not surprisingly, a Dutch girl and a Canadian bicycle-enthusiast were 100 per cent okay with. After all, the last time I rode a bike was in the fall, and I was dying to get back behind the handlebars of a two-wheeled steed. Walking up to one of the bicycle shops, we were immediately accosted by two young boys, both of whom looked to be about 12-years-old. They were from competing shops right next to one another. But puberty does not a good bike rental salesman make, and these preteens jibed back and forth with expert skill, battling for our business. Eventually, we settled on two pink cruisers, one from each shop. The boys looked satisfied, and after giving the brakes a quick test, we peddled off to explore. Part of Lumbini rests within a World Heritage Site in the centre of the town. That site is circled by a dusty brick pathway, containing large ponds that look like moats around the main complex. This path is the closest thing I’ve seen to bike path in Nepal (mountain bike trails excluded), and I joyously rode along it, revelling in the warm afternoon sun. From the path you can see the Maya Devi Temple from almost every angle. The temple is a tidy white building, the walls of which enclose the remains of former temple foundations, some as old as the 6th and 7th Century B.C. The Maya Devi Temple is the famed birthplace of the Buddha. Inside, a marker stone has been framed in plexiglass, its presence representing the exact spot where his birth is said to have taken place. I wait in line to pay tribute to the spot, and notice I’m standing behind half a dozen or so people, from all different nationalities, pushing to do the same. It’s then that I really grasp the significance of Lumbini and the importance of this specific place. Lumbini is a place of origin. Like Jerusalem for Christians or Mecca for Muslims, a visit to Lumbini means going back to the place where it all began – a place whose past events have the influence to shape lifetimes of beliefs. That was something pretty powerful, and I tried to look at the rest of the afternoon through that lens. A tourist stop for us, a pilgrimage for others. Leaving the Maya Devi Temple, Marlon and I wandered through the peaceful grass gardens of the site, padding around softly in our socked feet. At the start of the garden is The Puskarini, the pond where Maya Devi bathed before giving birth to the Buddha. I can feel my bones creak and ache as old men and women kneel from the terraced steps to splash their heads with the holy waters. Just a little further away is a tall tree that has a small temple carved into the base of its trunk. The bark is orange and red from the powder used for puja, and marigold petals cling to the tiny idol inside. 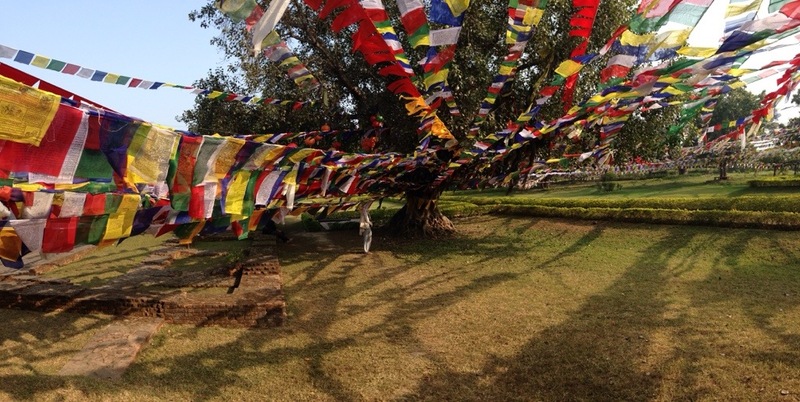 Hanging from this tree – and every other tree in the immediate area – are more strings of prayer flags than I have ever seen. They’re tangled in the branches amongst the leaves, and the red, blue, yellow, green and white squares of polyester and cotton form a spectacular rainbow hanging above our heads. Burning incense tingles my nostrils as I take a deep, relaxed breath. The World Heritage Site in Lumbini was really just the start of our explorations. Surrounding Maya Devi and that circular brick pathway sit the east and west monastic zones. Within these zones are more than 15 monasteries, representing countries from all over the world. From Thailand to Austria, China to Sri Lanka, all have constructed centres in which people can base their meditation. I was surprised by the obvious showiness and extravagance of the buildings, given the principle of Buddhism to separate life from material objects. Regardless of this anomaly, I had a great time biking around the different monastery sites, admiring the uniqueness and beauty of each. German monastery and grounds – by far the most impressive. The rest of the afternoon was spent blissfully cycling around the rest of Lumbini. A kilometre-long central canal connects the World Heritage Site and the monastic zones to the new Lumbini Village, and that became our bike route of choice. This is the Lumbini Museum, that sits at one far end of the central canal. Architecturally, it was love at first sight. Eventually the sun started to set over the flat fields of the Terai, a glowing ball of red repelling against the approaching dark sky. Biking at dusk remains one of my very favourite things. I wouldn’t say I was feeling enlightened after my afternoon exploring Lumbini, but I sure was damn happy. For now, that works for me. It must have been so exciting to be at the birthplace or the Buddha. Wonder would have filled my spirit. I think you and your friend made both of the bicycle rental shops happy. You are kind. I am glad that you are doing so many wonderful things both for your sake as well as mine as you share it so beautifully. I really like your blog :). I’ve just spent 30 minutes in rainy Netherlands reading your adventures, especially the elephant bathing shower thingy. Like the photos as well!